The alternatives we imagine are products of the times in which we live. A review of Peter Frase’s book Four Futures. Credit: Flickr/Charles Hutchins. Some rights reserved. Times of uncertainty inevitably bring with them an interest in the future. The unanchored feelings of the time lead us to wonder how things might turn out. A preoccupation with the future reflects a concern with what might become of us. These imagined futures are always political. They reaffirm, they scare, they motivate, and they limit. They also project meaning, justify and legitimate, promote nihilism or hope, invigorate and inspire or undermine and demoralise. 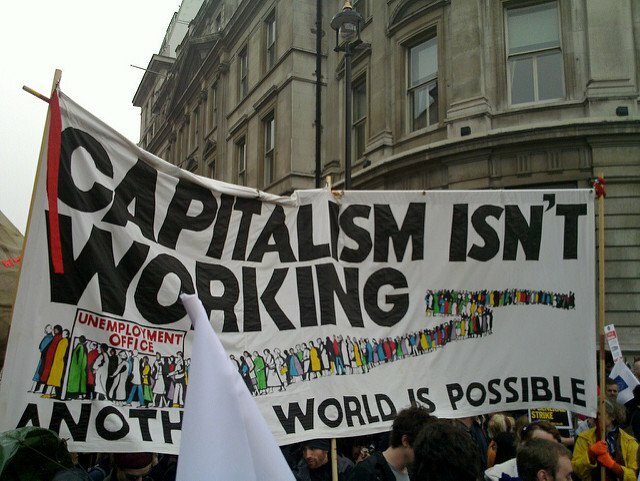 Given the uncertainty we are currently experiencing a renewed and intense interest in imagining a post-capitalist future shouldn’t be too much of a surprise. Our intensifying uncertainty is translated into the urgency with which our imaginations are called upon. What will emerge after these escalating disruptions to apparently established social orders? How can we make sense of our present through our imagined futures? Brexit looms. Trump leers. Populism shouts. Reactionary politics casts long shadows. The right and left tear at themselves and stretch outwards. International tensions simmer. This seems like an appropriate moment for re-envisioning, and contributions to this process are arriving at some pace. Peter Frase’s engaging short book Four Futures: Life After capitalism is another addition to this collective reimagining. For those looking for some solace Frase provides little comfort. His is a book that conjures up worrying and intimidating visions. Its frequent talk of scarcity means that I can’t seem to shake the dystopian film Mad Max from my mind. It’s not that Frase is talking of the same lawless and desolate landscape in which fuel is the only currency and the means of survival, it’s just a vision of the future that has stuck with me. Despite being unrecognisable, Mad Max always felt so plausible. Fortunately, Frase provides some alternatives. Indeed, his book sketches out four possible futures for ‘life after capitalism.’ Having a selection of options is perhaps no more comforting than one dystopian image, but at least there’s a smatter of hope dotted among some of the more appealing sets of outcomes that he provides. Frase doesn’t provide a clear set of actions or dwell in futurism—his book seems to leave it to the reader to try to reverse-engineer the futures that they want. But the author, who admits to being ‘deliberately hyperbolic,’ is clear that collective action around a shared vision is what’s required. Yet there is a pulse of inevitability driving the book forward, not an inevitability of outcome but an inevitability that things will need to change. There are two trends pushing at this sense of the inevitable: the increasing automation of work and the emergence of profound environmental changes. These two interconnected issues mean that transition of some form will be forced upon us. Of course, Frase couldn’t have foreseen all of the political upheavals that occurred in 2016. These changes add a further sense of cultural and political inevitability to Frase’s arguments. Reading the book in November 2016 forces some reflection on how future horizons may have been re-set by political opportunities and complex groundswells of opinion. The book’s future visions arrive as we hear claims of making things ‘great again’, with frequent calls on evocative and nostalgic versions of an imagined past, as discussed recently in Owen Hatherley’s book The Ministry of Nostalgia. I was left to wonder how versions of the past meet visions of the future to embolden political perspectives. The events of recent times are certain to force a shifting of these future horizons, especially as major events and incremental alterations to the social fabric compound. In short, we will be seeing the future differently as the circumstances in which we live continue to shift. Frase uses two intersecting spectrums to explore the potential futures he discusses. On the one hand, we have a spectrum running from inequality to hierarchy. On the other, we have scarcity to abundance. Mapping across these spectrums, Frase ends up outlining a typology of four futures: communism, rentism, socialism and exterminism. These are familiar perhaps, but Frase revisits them in some intriguing ways. He uses various illustrations to give a sense of materiality to these four possible futures. The relationship between power and the bundles of technologies that are embodied in robots, for example, brings with it an urgency for seeing how these technologies are presented and then deployed to enforce hierarchies. The role of intellectual property in power structures is revealing. The careful unpicking of the relationship between scarcity and hierarchy is also telling, as are the combinations of the different factors of inequality and abundance. But despite these insights, Frase can’t quite escape the shackles of the typology he has set for himself. I started wondering what other less familiar positions might be mapped onto these axes, or how new axes might be imagined. Similarly, I was left wondering about the tensions that emerge between the different imagined futures or between those who are invested in them. The book implicitly suggests that these tensions will be profound, but what about where visions clash or merge into new types of formations? I wanted a sense of potential hybrids or of the unimaginable. The book’s structure lends it coherence but at the same time it sets some limits that are occasionally based a little too much on established knowledge and concepts. Frase exercises his imagination beautifully and provocatively within these parameters, but I would have loved to have seen that same imagination exercised beyond these limits and beyond the categories that are used in the book. Re-envisioning the future in the current moment feels like it needs to draw from an eclectic and unconstrained set of resources, especially as current uncertainties make this task such a leap of the imagination. Frase uses fiction and other sources to stimulate his categories into life, but the use of a wider palette of fiction could have taken us beyond a set of futures that might have been expected, even if Frase manages to martial them in creative and unexpected ways. The concluding chapter of the book calls on Walter Benjamin’s famous essay on the concept of history. Frase’s focus is on Benjamin’s point about history being controlled by the victors. In that essay Benjamin also claims that we are moving backwards into the future, with the remnants of history piling-up in front of us. Frase’s book might allow us a quick glimpse over our shoulders into the advancing future, but as Benjamin points out in relation to history, our concept of the future, like the past, will be filled with the presence of the now. In other words, the futures we imagine are products of the times in which we live.